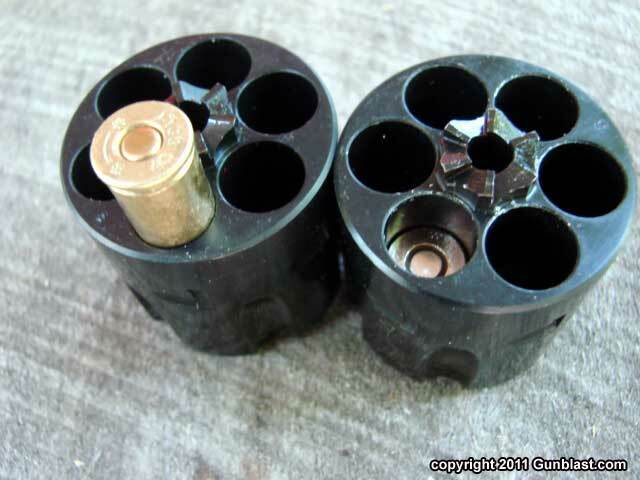 What is the difference between .45ACP and .45 Colt? Well a picture is worth a thousand words, right? Well, the ACP in .45 ACP stands for Automatic Colt Pistol, initially designed for Colt’s semi automatic 1911 model while, the .45 Colt was made for Colt’s single action Army pistol and the 45 Long Colt Rifle. Today there is some confusion over the Colt.45 and the .45 Long Colt. To end that dispute there is a simple answer! 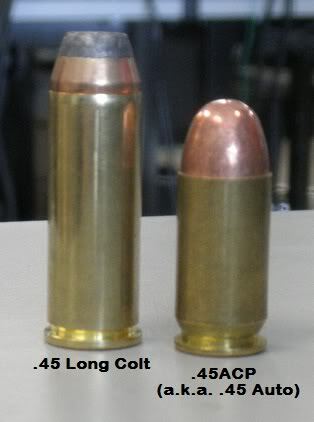 The Colt .45 and the .45 Long Colt is the same cartridge. To discern the differences between the three, and the non difference between the later, a little history is in order. Samuel Colt, may God be with him, designed the .45 ACP in 1904 for a prototype semi automatic pistol. This prototype ultimately became the infamous 1911 model that changed the way firearms were made and functioned up until this very day. affordable price and proved to be darn near indestructible despite the use and abuse they took out in the rugged west. (Emphasis on abuse). He designed the Colt .45 rifle to use the same cartridge that the pistol used to eliminate the old west cowboys from having to carry two different types of ammunition. Boy did he hit a nerve. Sales of the Colt single action pistol and rifle combination went through the roof and have never been matched by any firearm manufactures to this day. Much confusion has been in the newer gun owners’ minds over the question of the difference between the .45 Colt and .45 Long Colt nomenclatures in available rounds today. Well the truth of the matter is that THERE IS NO DIFFERENCE! Way back in the 1870’s the U.S. Army decided that it would use the Schofield .45 round as its’ standard issue ammunition. They decided to use the Schofield ammunition because it could be used in both the Colt as well as the Smith and Wesson side arms that they issued at the time. The .45 Colt could only be fired in the Colt. Somewhere along the lines of time, the standard Colt.45 round became known as the “.45 Long Colt” to differentiate between the two. The difference between the .45 ACP and the .45 Colt round IS significant! The .45 Colt ACP will NOT work in a Colt Single Action pistol or a Colt rifle! To that end, a .45 Colt or Long Colt will NOT work in a semi automatic pistol the likes of the Colt 1911. The visual cues are readily apparent when trying to load the rounds into the firearm. When reloading .45 Colt cartridges, standard reloading practices apply. 45 Colt reloading data should be followed and can be found on line or in most all of the reloading schedules that can be purchased today. All of the 45 colt reloading components are readily available through either on line or brick and mortar stores, testifying to the genius of Samuel Colts’ design. Thank you. This was on page two of Google. Had it popped up on 1, it would have saved me a ton of time. This was the best, most precise, and comprehensive answer I’ve seen. Thank you, again. I was hopping to be able to use the same ammo in my springfield semiauto 45 and a henry lever action but that does not seem to be. is there a rifle that is chambered for 45acp? I agree with Joey, very informative! Thanks a bunch.Getting ready to reload some 45 app.Now no worries about the cases being the wrong ones. 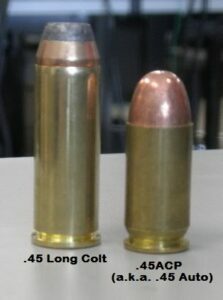 Hey Buddy!, I found this information for you: "45 ACP VS. 45 COLT". Here is the website link: https://thegunrights.com/45-acp-vs-45-colt/. Thank you.